My ‘mission’ for organization is typically tackled in the winter months when it is too cold outside for digging in the dirt. However, there is one absolute MUST for at least one cold spring day (Here in Cedar we actually have more cold spring days than warm… like today, April 30th, the temperature is 35 degrees with 35 mile an hour, freezing cold winds. Good bye all hopes of fruit bearing trees!!) This MUST includes cleaning out the winter clothes and making room for the shorts and flip flops. #1- Does it fit me properly; not too large, too small, too long, too short, too tight? #2 – Is it in good condition; no holes, no stains, no unintentional stretchy places? #3 – Did I feel good wearing it; does it make me look too old, too young, too frumpy? #4 – Do I really think I will ever ENJOY wearing it again? #5- Do I need it for some specific occasion? If I am unable to answer YES to all of the above questions it is time to move on to question set “B”. 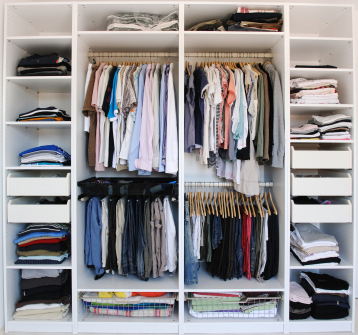 #1 – Will the specified piece of clothing look better hanging in someone elses closet? (if yes, it goes to good will). #2 – Would it be something I would wear at the cabin or camping or hiking? (if yes, off it goes to the cabin closet). I have a large closet and a quite a few clothes, so this process can take a very long time. After I attack my own clothing, the above mentioned questions are applied to my husband and childrens wardrobes. After all was said and done I had 3 trash bags heading off to good will, 1 bag to my sister-in-law with little girls just younger than my daughter, and 1 small bag labled “CABIN” for when the pass is open (ie. the snow has melted…. I know, a very 7 brides for 7 brothers-ish comment). One issue that I am faced with when organizing my own clothes is my fluxuating size. My husband is lucky enough to be wearing the same size of clothes he wore 10 years ago. My kids are constantly growing, but they also wear out their clothes so there isn’t much of an issue of keeping them for later, and it is always fun to shop for new childrens clothes because they are relatively inexpensive; (thank you TARGET) ‘out with the old in with the new’. However, things are much more complicated when dealing with myself. As I am still in the lovely ‘child bearing years’ I am constantly bouncing between about 3 different sizes. My closet is not big enough to hold 3 separate wardrobes so I enlist the help of a few large storage buckets. I try to take very good care of my clothes so I hate to see them hauled off to good will when I will very likely be needing them again in the not-to-distant future. One bucket is very blatently labled “MATERNITY”. One is used for holding POST-MATERNITY clothing (Both winter and summer) and my favorite bucket is for PRE-MATERNITY clothing. Every 6 months the clothes within these three buckets, along with my closet, are shuffled, moved, rearranged, and repacked. Leaving the space in my closet for the stuff I will actually wear. I found a picture at Better Homes and Gardens. I have always believed closets, drawers, and cupboards should be “attractive” looking; free from clutter, dirt, dust, and excessive amounts of JUNK. The floor space should be as empty as possible. However, I’d like to know the person who lives with 8 Pairs of shoes (all beige), 9 tops (all beige), and 4 pair of pants (all beige). Yes, it makes for a very nice, clean looking closet but really?? this doesn’t seem very practical. My goal is for my closet to be functional and clean, providing the perfect home for my clothing to reside. BHG will never call asking for a picture of my closet to put on their website, but it works for me! One thing to keep in mind is that your closet can be full but should never be stuffed. A large closet should easily hold many articles of clothing but if you have to push, shove, and manipulate the clothing-filled-hangers you have too many items in that space. The number one rule to organization is; if your stuff doesn’t fit either find more space or get less stuff.